The Version 3 unit is arranged with a LED illumination system and, like the VersaElite version, it represents a high-level technological solution with its rollaway system that allows you to provide electricity to kitchen tops, executive offices, working stations and worktops. It is used when needed, and after that, it goes down manually and stops at the top surface level, leaving it free. Moreover, thanks to the LED system, it can be easily located i the dark ; at the same time it works as a courtesy light. This is a plug-and-play system. With soft pressure it is easy to open the lock system: VersaLed lifts itself up a bit and it can be completely manually raised. Thanks to the special rubber gasket, it is possible to avoid water seepage: this grants the use of this product on every type of worktop. Info: Variable extraction plug & play power supply system. Can be used in office, conference rooms, kitchens etc. 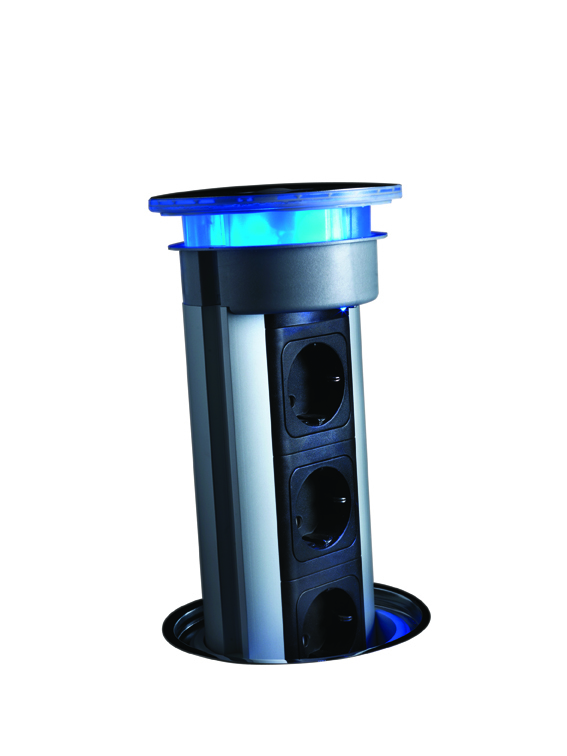 Version 3 is supplied with 3 power sockets and blue LED light. Available with different power sockets. 220 V – 250 V, 50 Hz 3400 W maximum load power, indoor use only. Colour frames available; Version 3: Polished chrome mat, 2 metercables included.